CAN WE ORDER SOME NEW KNEES?? "Don't they have Jiffy Lubes just about everywhere?" All good things must come to an end, according to an old adage. In this case, we reluctantly cut our winter trip short by about three weeks because both of us had knee "issues" that were best addressed by our orthopedist in Roanoke. 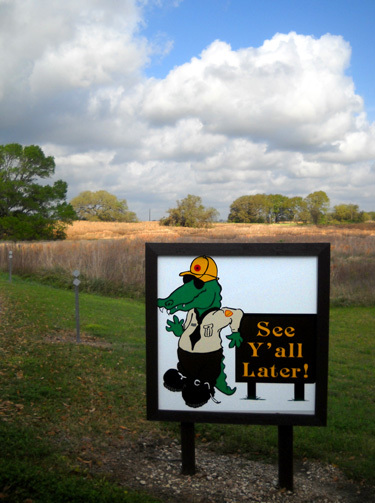 We gave notice at the end of February to Tina, the volunteer coordinator at Brazos Bend State Park, so she could adjust the March campground host work schedule accordingly. Ironically, it was also knee problems that delayed the beginning of our Winter 2010-2011 trip for two or three weeks. Instead of being on the road for 4� to 5 months as we originally envisioned, we were traveling in our RV for only 3� months. That's OK. At our age, maintaining our health is paramount. If we aren't healthy, we can't do the traveling and physical activities we enjoy so much. Jim tore the meniscus in one of his knees last November 14 during a bike accident. He had fairly routine in-patient surgery to repair the damage on December 1and a follow-up visit with our orthopedist, Dr. Johnson, on December 6. 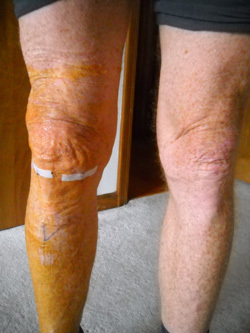 Jim got to take the bandages off his knee three days after surgery. Note the check mark to make sure the doctor got the right leg! We left on our winter trip that day, with fairly vague instructions for Jim to take it easy for a few days or weeks, then resume running when it didn't hurt. When Jim specifically asked about running ATY at the end of the month, the doc said, "Go ahead. You can't hurt anything." Well, it's hurt most of the time since then, regardless of how much and what type of exercise Jim has done. He's tried total rest, just walking and cycling, and some running. His knee continues to ache no matter what he does. Oddly, his knee feels better when he's active than when he's sedentary. It aches when he's sitting or lying down and is particularly bothersome when he's trying to sleep. He hasn't had consistently good sleep since the surgery. The six chiropractic adjustments and deep tissue massage treatments he had in Texas during February helped but they didn't solve the problem. Neither do pain meds or sleeping pills; they partially address the symptoms, but don't remedy the cause. Jim has become increasingly despondent from the lack of sleep, the frustration of not knowing what's wrong or how to fix it, and being unable to run. Until this week, he even began to wonder if he'd ever be able to run again. I keep telling him it's not the end of the world if/when he can no longer run, but he hasn't had as much time to adjust to that possibility as I did when my knees began to significantly deteriorate. Any athlete who's been sidelined from his or her favorite sport for any period of time because of an injury or serious illness knows what Jim was going through. It's agonizing at the time, and such a relief if/when you can resume training again. Jim and I have both "been there, done that" too many times. 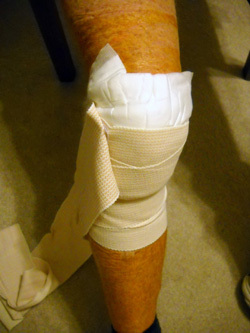 Jim rested after meniscus surgery and gradually began walking after a week or two. Four weeks after surgery, he walked for enough hours at ATY to accumulate 32 miles. This is one of our favorite races. as possible during the 24-hour race sounded like a good idea at the time . . . Despite the cold, rainy weather he was happy to be on the track with friends and kept going longer than he originally thought he'd be able to do. His knee felt no worse after that race than before it. 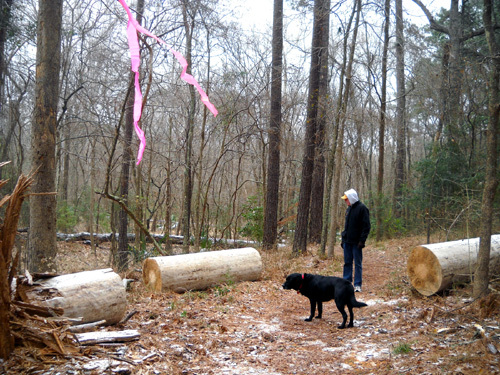 After recovering from his effort at ATY, Jim tried to resume training for the Rocky Raccoon 50-miler on February 5. This is when his problems really became evident. Running felt good when he was running . . . but he wasn't able to "shake the ache" after each run or walk. His weekly running/walking totals in January were 9, 30, 23, 50, and 2 miles, plus 14 miles on the bike. Because of the continuing pain Jim had after running it became increasingly obvious that trying to run 50 miles at Rocky on February 5 was pointless; he simply wasn't adequately trained and was afraid he'd do further damage to his knee. But he was hopeful until right before the race. He called Dr. Johnson from Texas at the end of January to discuss the problem and have better information to decide about running the race. The doctor was very surprised he was having so much trouble with his knee. The surgery was simple and it appeared that Jim's knee would heal promptly. His recommendation wasn't exactly what Jim wanted to hear, to put it mildly. Dr. Johnson obviously couldn't diagnose the problem long distance and we didn't want to go back to Roanoke that early for an appointment with him. All he could recommend on the phone was for Jim to stop running completely and do only whatever walking and cycling didn't make his knee feel worse later. If that didn't help, Dr. Johnson said for Jim to come back in when we returned to Roanoke and he'd try to figure out what was wrong. Jim was compliant with the doctor's recommendation and did no running from the last few days in January to March 12. 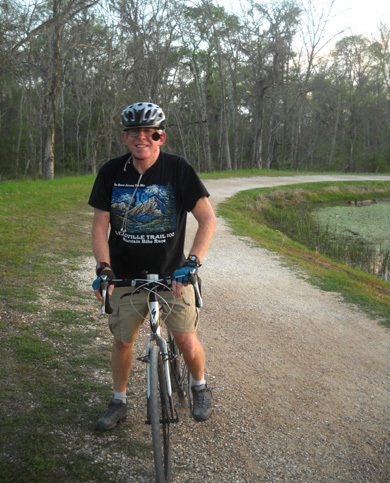 During the entire month of February he walked only 8+ miles for exercise and rode the bike about 55 miles while we were at Huntsville and Brazos Bend state parks in Texas. 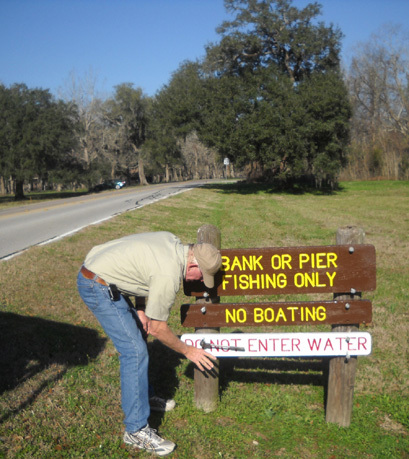 He was also fairly active doing various campground host duties at Brazos Bend, which helped take his mind off not being able to run. Picking up litter and putting newly-painted signs back up was at least some exercise. 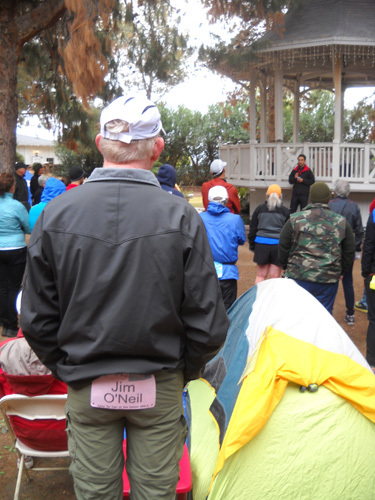 Although Jim was concerned about maybe never being able to run again, he had enough optimism that he signed up for the Jemez Mountain and Bighorn Mountain 50-milers before their entries closed. That gave him some hope of maybe being able to salvage part of his 2011 race season. The first two weeks in March Jim walked a total of about 11 miles for exercise and rode the bike 55 miles. His knee felt a little better but still hurt when he was sedentary. On March 12 he decided to test his knee by running some during a 6-mile walk. Since it didn't ache afterward any more than when he just walked, he ran-walked 8 miles the next day. Unfortunately, he paid for it with increased swelling, heat, and pain in the injured knee. He walked only a mile or two for exercise the rest of the month and rode the bike about 39 miles. By the end of February we had already decided to return to Roanoke the third week of March so I could get my knee injections. Jim made an appointment to see Dr. Johnson on March 28 to try to determine the source of his knee discomfort. Jim was able to get in a little sooner than that to see our chiropractor. The adjustment he got last Friday helped his back, but didn't make any difference to his knee. I went with Jim to see the orthopedist on Monday of this week. After listening to Jim's symptoms and x-raying the knee, Dr. Johnson determined that a steroid injection (not cortisone) might do the trick. There was some inflammation but no other discernable problem. To Jim's utter amazement, the steroid shot already seems to have done the trick in only a few days! He noticed relief almost immediately. He's already sleeping better and his knee doesn't ache when he's not moving around. If only we'd known the solution was this simple, he might have been able to get a steroid shot from another doctor while we were in Texas. As you can imagine he's chomping at the bit to resume running! Dr. Johnson said to rest the knee for two more weeks, then gradually resume training. We have our fingers crossed that the steroid will resolve the knee problem. Now Jim is more optimistic about the races he can run this summer. 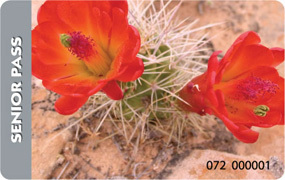 He registered already for the Jemez Mountain and Bighorn 50-milers in May and June in order to get into the events before they closed out. The race directors say he can drop down to the 50Ks at either or both races if he's unable to train adequately for the longer distances. 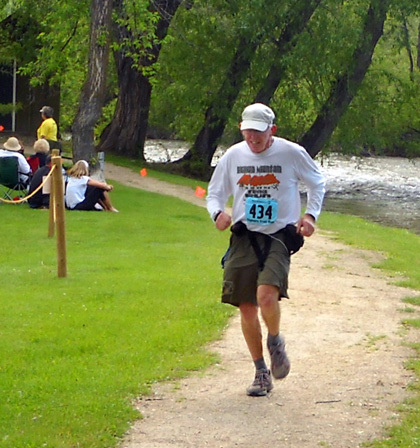 He'd like to run the North Fork 50K or 50-miler in July again, and maybe the Grand Teton 50-miler in September. He's also considering pacing at one or more 100-milers this summer; Hardrock, Leadville, and Wasatch are possibilities. His long-term goal this year is to run the Bear 100 in late September. The races leading up to it will essentially be training runs. 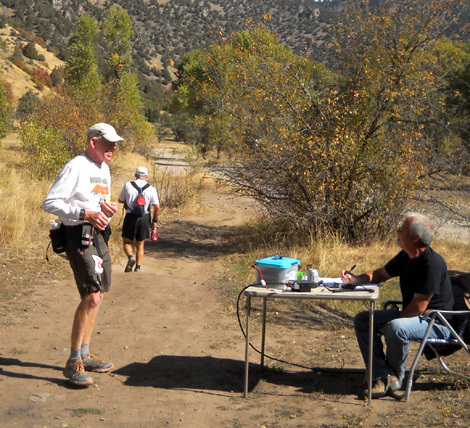 Jim talks with an AS volunteer at The Bear 100 last September. Now we're making more solid plans for our next trip out West, which will hopefully begin in early May and last through all or part of October. More about that later. Our schedule will look a lot like last summer's, with a few modifications. Jim's knee problem was temporary -- long-lasting, but basically a temporary injury that has hopefully resolved itself. He should be able to resume running again soon. My knee problem is permanent and will only get worse, but the current "fix" is obvious and fairly easy -- I've gone too long without Orthovisc and need another round of injections so I can continue walking and hiking comfortably. It is not in my best interest to run because the pounding exacerbates my knee deterioration. 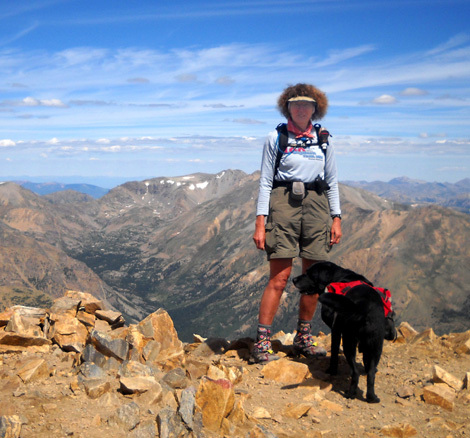 One of my last and most-favorite ultras: the Bighorn Mtn. 50K in June, 2009. The course has too many downhill miles for me to even consider walking all of it now. Orthovisc is the brand of visco-supplementation (lubrication) I get for the osteoarthritis in my knees. I'm bone-on-bone in both of them. Orthovisc works great for me -- as long as I get it before I need it, not after it absorbs into my body to the extent that my knees start hurting again. This is the longest I've gone without the injections, almost eleven months. That's too long for me. One of my knees began hurting again shortly after we left Roanoke in December; the better knee began hurting in January. I've had to limit the number of miles I've been walking. I hate that. 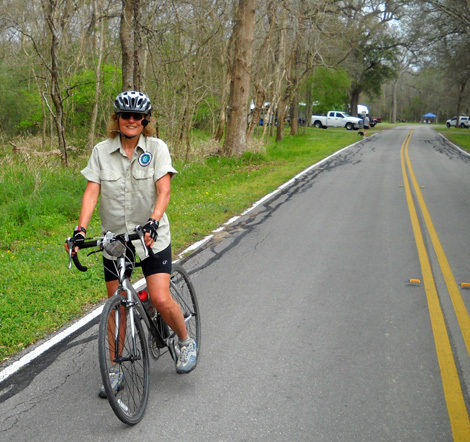 With all the great trails at McDowell Mountain Park in the Phoenix area and at Brazos Bend State Park in Texas I was able to increase the number of miles I cycled, but I enjoy walking more than biking. That's very high cycling mileage for me historically. It felt great, too! Unfortunately, I won't be able to do that much biking while we're in Roanoke. I just don't have the convenient, safe road or trail options that I did at Brazos Bend. I'd love to get out and ride on the nearby Blue Ridge Parkway, for example, but some people drive like maniacs there (not the 45 MPH speed limit). I'm hoping I'll be able to ride more when we're traveling this summer. I also want to increase my hiking miles and climb some more mountains this summer. I need my mountain fix. I had some awesome hikes last summer! I should be able to resume doing that after these current knee injections take effect. 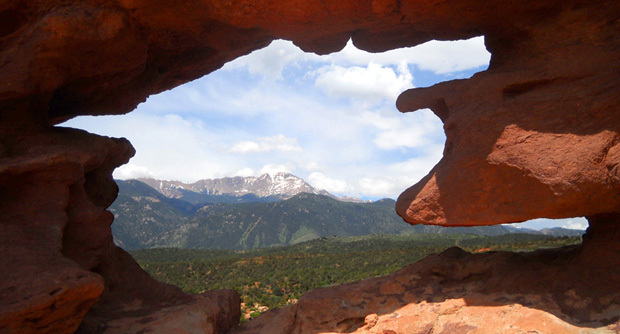 It was hard enough giving up running 2+ years ago; I'm not ready to give up hiking, too. High on Table Mountain in the Tetons late last August. My experience with Orthovisc shows that my knees will be feeling better soon. My very first round of Orthovisc, which is injected 2 CCs at a time, once a week over a three-week period, was in the fall of 2009. My worse knee was starting to hurt by the time we went back to Roanoke the next spring (2010) so I got my second series of injections then. The first two series were about seven months apart. That was a good decision. With enough cushioning in my knees I was able to climb all sorts of mountains last summer and felt rather invincible. When we returned to Roanoke last fall my knees still felt good. I seriously considered getting another round of injections then, despite the cost (not nearly so much to me as to the insurance company), but I decided to wait to see just how long the Orthovisc would last. That was a mistake I probably won't repeat. I wish I had gotten the Orthovisc last fall because the risk I took -- that my knees would start hurting again while I was one or two thousand miles away from my orthopedist -- was very real. And now it's one of the two reasons we had to go back to Virginia earlier than planned. Here's another peak I want to climb again: Mt. 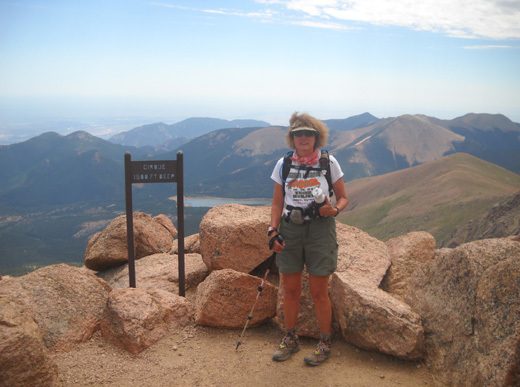 Elbert, Colorado's highest 14er. This is a complicated medical process; it's not just a matter of finding another doctor to give me the injections in Texas or Colorado or wherever we are traveling at the particular time I need them. It's actually a lot easier to go back to Roanoke than jump through all the hoops of 1) finding a competent orthopedist somewhere that's a preferred provider with my insurance company AND 2) uses Orthovisc, 3) being able to make an appointment in this lifetime when I'm not an established patient, and 4) either having my previous medical records sent to the new doctor or 5) going through that rigmarole again (MRI, x-rays, etc.). But I still laughed out loud at Matt's funny e-mail re: Jiffy Lubes! If only it was that easy. 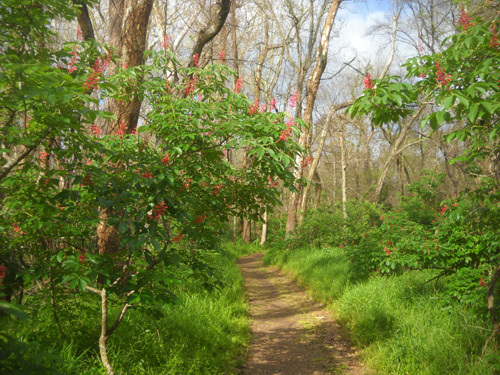 The Wolf Creek Greenway is one of my favorite places to hike and bike in Roanoke. 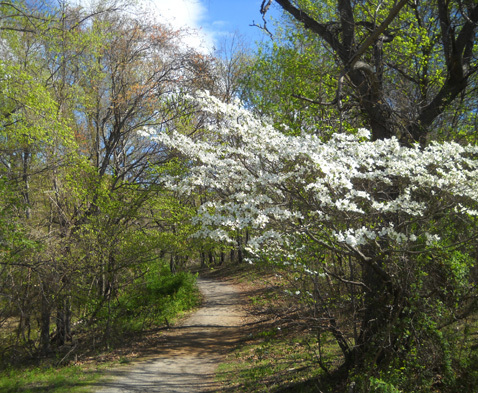 It's especially scenic in the spring and fall when we are in the area. I got my first round of Orthovisc last Thursday and my second injection today. The third and last injections are next Thursday. I can already feel an improvement in both knees. I should be able to start increasing my walking distances soon. And that makes me very happy. 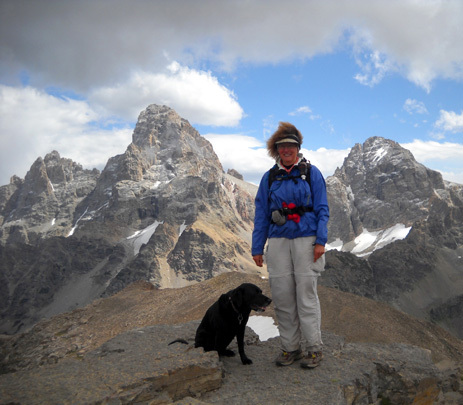 I have some training to do so I can repeat those great hikes I had in the Rockies last summer and come up with some new adventures! The older I get, the less I celebrate my birthday in a conventional manner. Maybe if I ignore it, it didn't happen and I'm not one year closer to the grave?? Today's the day I turned 62. I celebrated it quietly by getting more Orthovisc and a wonderful sports massage. I talked Jim into getting a massage, too. Because of the timing of those appointments we decided to wait until tomorrow to have lunch at one of the Thai restaurants in town. All I want or need on my birthday are a few "real" cards, some e-greetings from friends who saw my name at the top of today's ultra list's birthday list (oldest first, which on March 31 is me), and lunch at a good Thai restaurant. That's my favorite ethnic food. My sports massage therapist just happened to have two spots open today. I would have gotten the massage anyway, so that wasn't really a gift. It was a nice treat, though. There are some real advantages to turning 62. The main one is that I'm still alive and in pretty good shape! In addition, now I can collect Social Security when I decide is best to begin and get my own National Parks Senior Pass for a mere $10 for life (unless the NPS changes the deal and doesn't grandfather me). Can you believe I'm more excited about that $10 national parks pass than getting Social Security??? The reason is pretty simple, really. I've never counted on Social Security to fund my retirement and I don't intend to collect it for a while. My goal is to live about 38 more years. I want those checks to be as high as possible -- assuming that government deal also doesn't significantly change in the coming years and I end up with nada. Jim jokes about being eligible for his "old age checks." Not me. I'm still coming to grips with middle age. No way I'm a senior citizen already . . . I cannot possibly be old enough to collect Social Security!! Head firmly in the sand . . . The national parks pass I can use now. And I can more easily ignore the fact that I had to turn 62 to be eligible for it! Even though Jim has one of these passes it doesn't do me any good when I want to visit a nearby park or monument by myself, or even go out of one we're camped in and come back in. 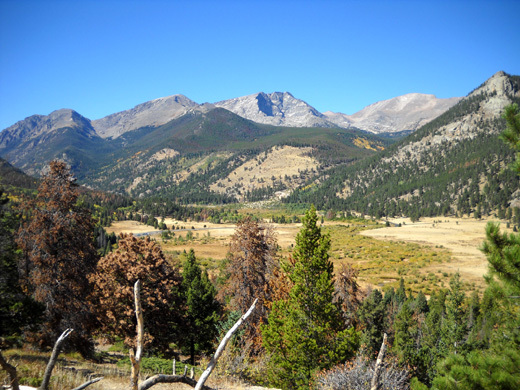 I almost learned that the hard way last fall at Rocky Mountain National Park when I went out past the entrance gate to the main visitor center (why was it outside the park to begin with??). I had to sweet-talk my way back into the park to get in with Jim's pass. I came close to having to pay the entrance fee. Anyway, thank you very much for all the nice birthday cards and e-greetings I received this week. They make this milestone birthday a lot more tolerable! Next entry: Is it time to list our house for sale yet so we can begin full-timing in the Cameo? More decisions . . .